AIA Shanghai wishes everyone a pleasant and safe National Week Holiday! It's October and 2018 is starting to wind down. Submissions for the first annual AIA Shanghai Design awards closed last month with over 100 entries. Look for upcoming information about the judging process. Our year-end and awards Banquet will be on Decemeber 1st. Several important events will happen in October. We will have our first Beijing building tour: the Beijing New Airport Terminal Building by Zaha Hadid Architects. US Green Building Council's Greenbuild conference will be on the 23rd and 24th at the Shanghai tower. Also, nominations for our upcoming 2019 officer elections will open. Candidate nominations for the 2019 officer election will open in October. All AIAShanghai members are eligible to run for office and encouraged to participate. Greenbuild China will take place October 23–24 at the Shanghai Tower. This year's show theme is "Human x Nature," focusing on the intersection of humanity and the built environment. Those who attend are invited to join EXCO Katherine Zhu Schleiss for the Women in Green Power breakfast on October 24. Submissions closed last month for our awards program, and we received over 100 entries! Thank you to everyone who submitted. The awards banquet will be held on December 1st. This year's judges will include Billie Tsien, Reed Kroloff, Regine Leibinger and others. Check our Website for updates and future details. Co-organized by ASSC (the Architectural Society of Shanghai China) and AIAShanghai, the forum “Architectural Expression and Curtain Wall Innovation” turned out to be a huge success, drawing nearly 300 architects and curtain wall industry professionals to the Shanghai Design Center on September 20. 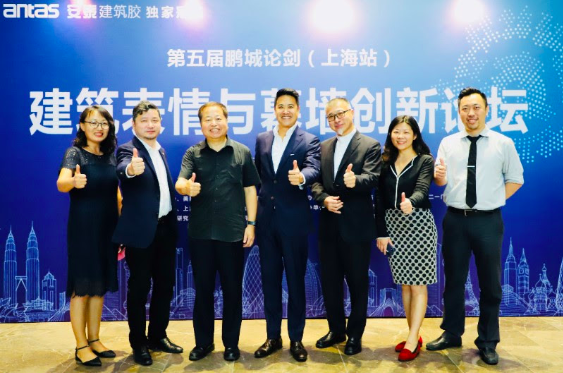 With ten local and international speakers, the forum brought a forward-thinking of design, technology and material innovation of curtain wall in the new digital era, as well as a comprehensive overview of new policies and regulations under the current political and economic environment in China. Mr. Cao JiaMing, president of ASSC, and Mr. Alton Chow, president of AIA SH, both made warm opening remarks and emphasized the collaborative significance of the event. On August 16th, we had our monthly networking event a Café Sambal. Andy To gave a presentation about the United States Green Building Council (USGBC) for North Asia. We had our monthly happy hour event a Café Zara on September 20. The AIASH Beijing group gave an introduction to the new activities in Beijing, including upcoming tours and lectures. Members of theAIAShanghai EXCO met our 2018 Sponsors for dinner on September 26th to get their feedback and thank them for all of their support.